A thoughtful look at the aftermath of the 9/11 terrorist attacks on America and how it changed us...for the better. I miss 9/12. 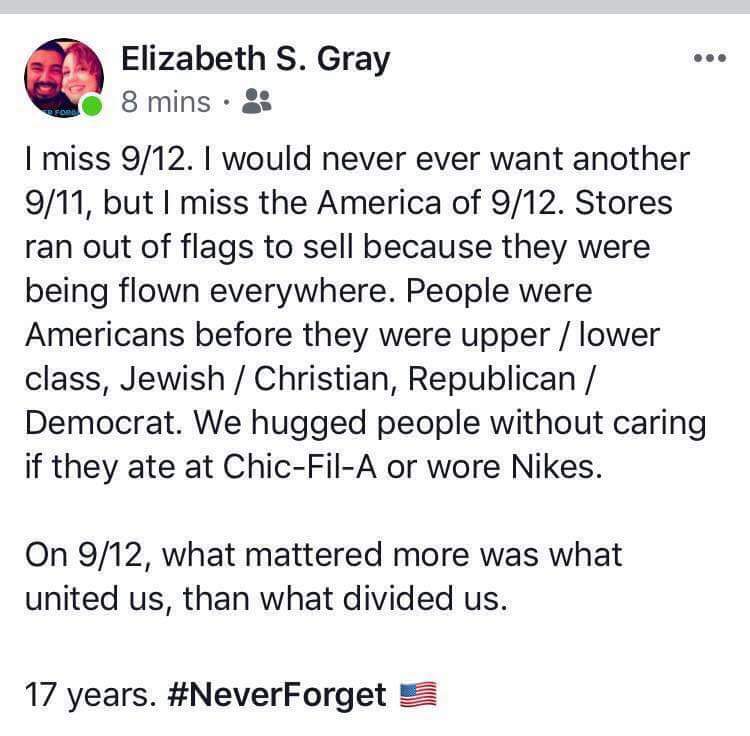 I would never want another 9/11, but I miss the America of 9/12. Stores ran out of flags to sell because they were being flown everywhere. People were Americans before they were upper/lower class, Jewish/Christian, Republican/Democrat. We hugged people without caring if they ate Chic-Fil-A or wore Nikes. On 9/12, what mattered more to us was what united us, not divided us. We cannot go back in time and capture that same spirit, but maybe if we tried to share a little it might go a long way in today's America.